About six years ago, my good friend, Anna Hansen, asked me to help produce a fundraising dinner and bike ride for a cause that is very close to her heart , and we've been doing it every summer since. Anna volunteered for Camp Wapiyapi in her 20s, and it was an experience that left a permanent impression. Anna's fiancé, Lance Armstrong, and his Loyal Lieutenant from his cycling days, George Hincapie, lead a bike ride with the donors in the morning then everyone rests up and regroups for a fun dinner at Lance and Anna's home in Aspen. In 2017, Patron Tequila partnered with us to make the dinner more exciting. It's a known fact that tequila makes everything more fun, right? The CMO of Patron, Lee Applebaum, is good friends with Lance, and Lee offered to donate without hesitation. Patron has an amazing arsenal of craft cocktails centered around tequila. They brought in bartender extraordinaire from The Little Nell, Ricardo Leyvas, to mix everything to perfection. To make the night unforgettable and over the top, Lyle Lovett performed for us before dinner. Lance even joined his long time buddy on the mic for a song or two. Believe it or not, Lance wasn't too bad. Lyle didn't ask him to go on tour with him but maybe next year. To balance out the tequila, we also had the awesome Randy Lewis of Lewis Cellars in attendance with great wines. Master sommelier, Bobby Stuckey, has partnered with us on the dinner every year to teach us some of his wine tasting tricks and break down the complicated skill of identifying wine profiles. The energy and generosity at this dinner are beyond impressive and make a huge impact on the camp's ability to host more campers each summer. We love doing this dinner and really, really love that it makes an impact on such an amazing organization. Camp Wapiyapi is a summer camp for children facing pediatric cancer and their siblings. Kids attend the camp at no cost to the families, so the amazing guests of the dinner know that for roughly every $1,000 they donate, a kid goes to camp. Please visit www.campwapiyapi.org to learn more about the great things they do. In 2011, we developed a fundraising concept for Livestrong Foundation that was a lot of fun to produce. We called it the Celebrity Chef Dinner Series. First, we found a donor that was willing to host a dinner at their home. Next, we found celebrity chef that was willing to create and prepare the menu. Lance has great relationships with some amazing chefs, so they were more than willing to be involved, which made that ask easy. We kept the guest list of prospective donors under 30 people. Craven + Co. came in and planned everything to make the dinners run smoothly, so that the host didn’t have to worry about any of the details. We were grateful that they had opened their home and invited people they thought would be inspired by the Livestrong mission. This one was in Aspen, Colorado. Michael Goldberg, owner of Belly Up Aspen, offered the use of his home. Our chef was renowned celebrity chef and restauranteur, Wolfgang Puck. I think Wolfgang was a celebrity chef before we even had the term "celebrity chef." He brought his amazing staff from Spago in Beaver Creek. They took over the kitchen and blew the guests away. I worked closely with Wolfgang’s right hand man, Tom Kaplan. He has been working with Wolfgang for 34 years now. The two of them have worked side by side to take the company from a few restaurants in 1982 to the mega brand it is today. Tom is incredible to work with. He is generous, creative and was beyond helpful with getting the entire celebrity chef dinner series off the ground. Wolfgang came out for each course and talked about why he chose the menu he did. We also had the incredible winemaker (and former race car driver) with the infectious laugh, Randy Lewis, there and he took turns talking about the pairings he had made for Wolfgang's menu. Lance has been friends with Wolfgang and Randy for a long time, so they did their usual banter back and forth and the guests loved it. We had stainless steel menus screen printed that Lance, Wolfgang and Randy autographed at the end of the night for guests to take home. We used calligraphed tags tied with LIVESTRONG yellow ribbon to coordinate the wine glasses with the dinner courses they were paired with. The gorgeous floral was from Mountain Flowers of Aspen. 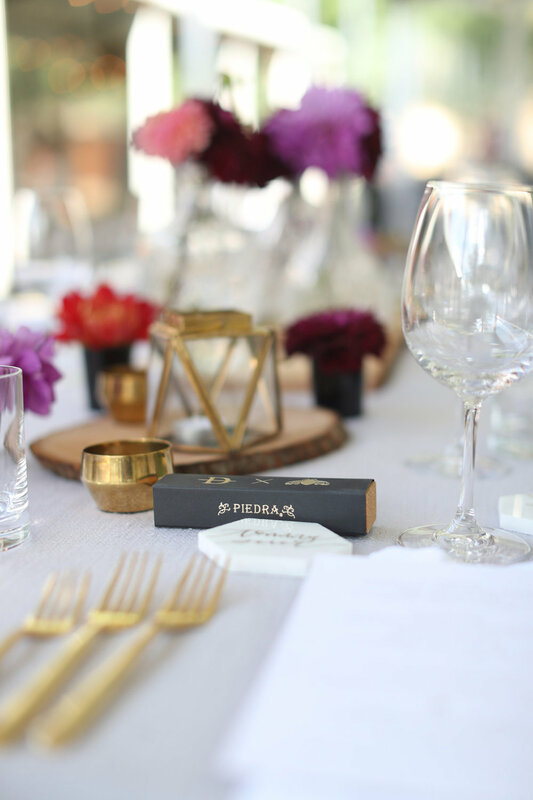 We finished out the tablescape with bold black glass candles by Dayna Decker with her signature wide wooden wicks in our modern glass and chrome hurricanes. With Aspen Mountain as our backdrop, it was an unforgettable night. And with the generous donation of the food, wine and venue, it was a great night helping empower cancer survivors.